Pink Cone Geyser erupts. Pink Cone Geyser reaches 30 feet in height, and has highly variable interval and duration. It is a cone-type geyser and its cone has a pinkish tint due to manganese oxide in it. Firehole Lake Drive, Lower Geyser Basin, Yellowstone Park. Pink Cone Geyser Photo. 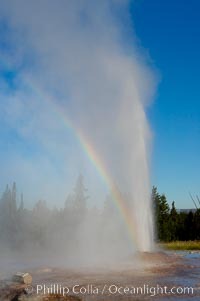 A rainbow appears in the spray of Pink Cone Geyser. Pink Cone Geyser reaches 30 feet in height, and has highly variable interval and duration. It is a cone-type geyser and its cone has a pinkish tint due to manganese oxide in it. Firehole Lake Drive, Lower Geyser Basin, Yellowstone Park. Pink Cone Geyser Picture. 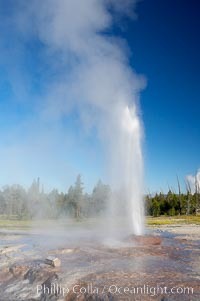 Stock Photography of Pink Cone Geyser. Photograph of Pink Cone Geyser. Professional stock photos of Pink Cone Geyser.